SAM99 Special Topics. 2 Topics Some transactions require very specific instructions for SAM99 reporting. Periodically, topics will be added to this presentation. 4 4 Service Revolving Fund: Accounts for charges for printing and procurement services rendered by the Department of General Services (DGS) for state departments and other public entities. The advance provides working capital to the service revolving fund and prevents the agency charged from spending the average monthly amount paid to DGS. 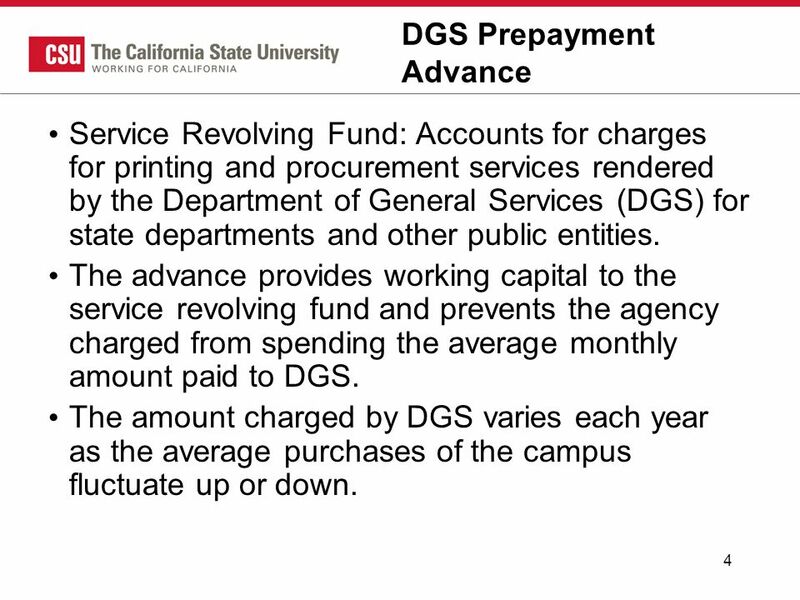 The amount charged by DGS varies each year as the average purchases of the campus fluctuate up or down. 5 5 Journal entry Journal Entry to Record the Advance: DR - 107005 Prepay Service Revolving Fund-Services CR - 305022 Fund Balance Clearing FIRMS object code 107005 and all other objects mapping to State GL account 1730 “Prepayments to Other Funds or Appropriations” are ignored or not picked up on line 3 “Reverse Agency Original Prior Year Accruals” of the SAM99. 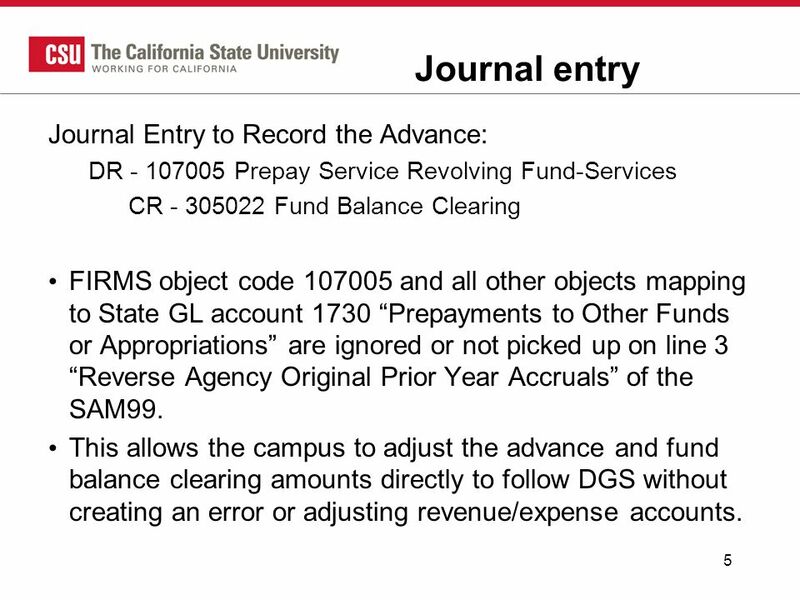 This allows the campus to adjust the advance and fund balance clearing amounts directly to follow DGS without creating an error or adjusting revenue/expense accounts. 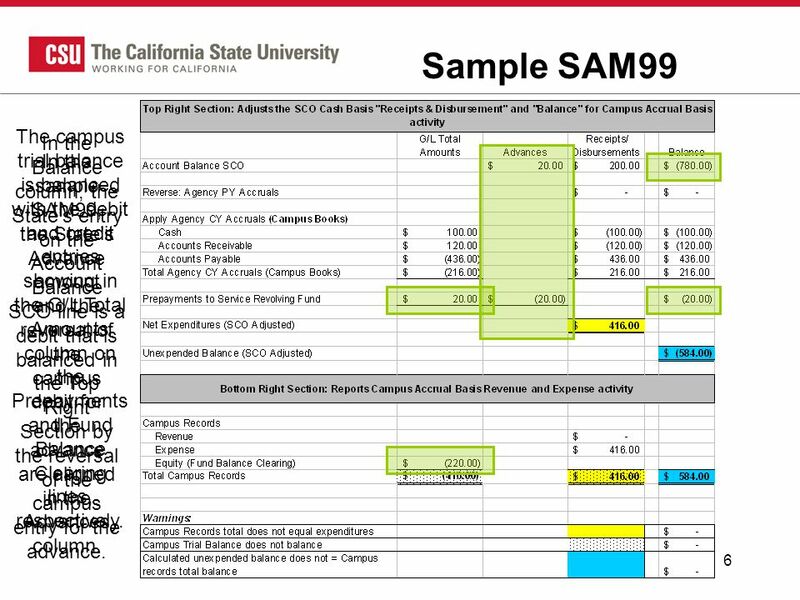 6 6 Sample SAM99 In the sample SAM99, the State’s Advance amount and the reversal of the campus debit for the advance are aligned in the Advances column. 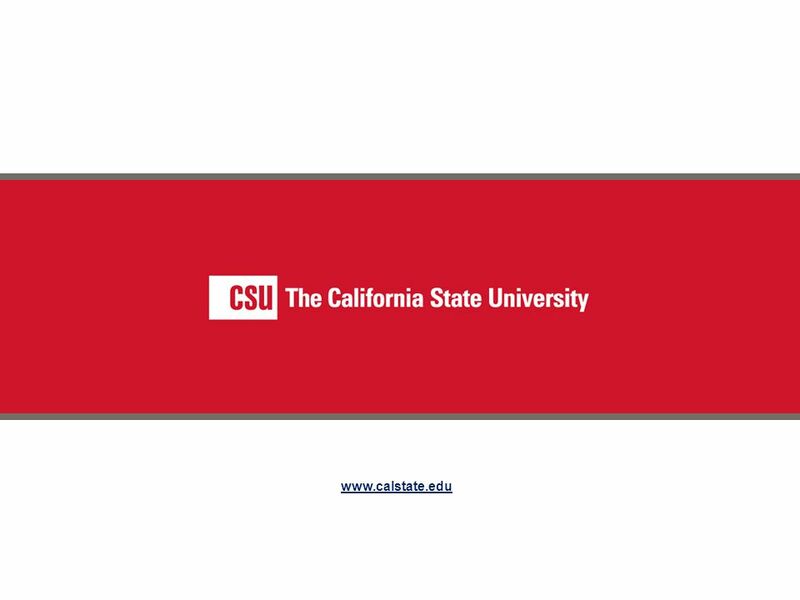 In the Balance column, the State’s entry on the Account Balance SCO line is a debit that is balanced in the Top Right Section by the reversal of the campus entry for the advance. 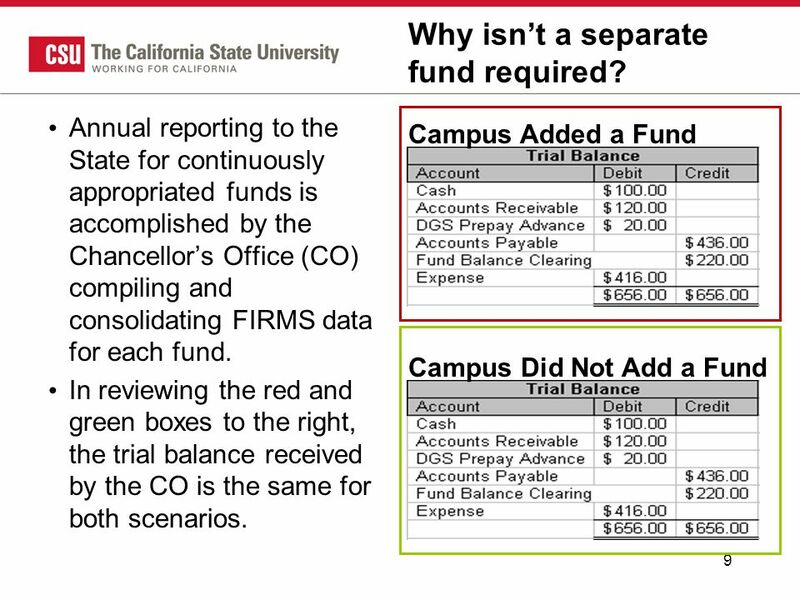 The campus trial balance is balanced with the debit and credit entries showing in the G/L Total Amounts column on the Prepayments and Fund Balance Clearing lines, respectively. 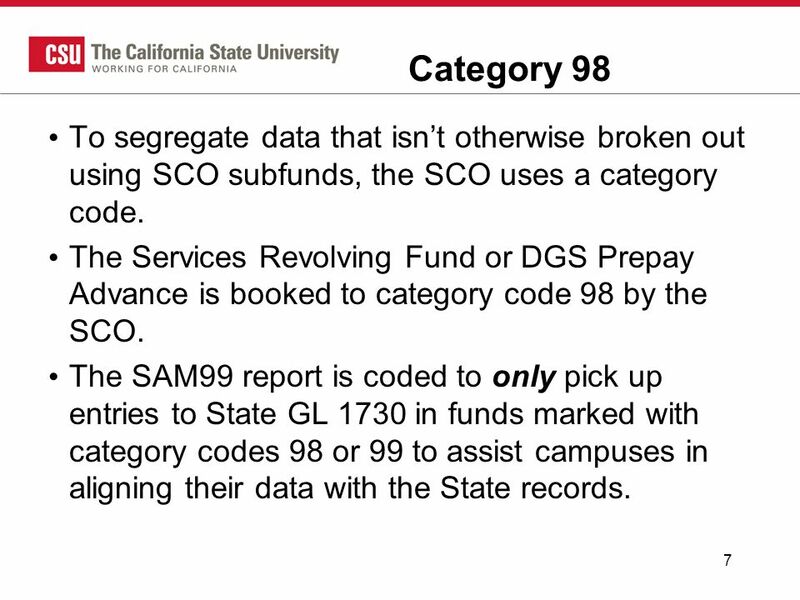 7 7 Category 98 To segregate data that isn’t otherwise broken out using SCO subfunds, the SCO uses a category code. The Services Revolving Fund or DGS Prepay Advance is booked to category code 98 by the SCO. 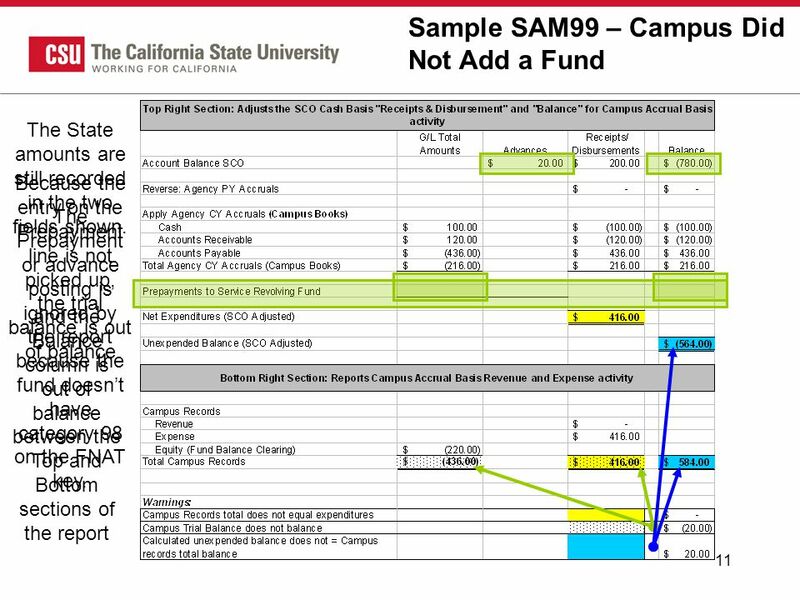 The SAM99 report is coded to only pick up entries to State GL 1730 in funds marked with category codes 98 or 99 to assist campuses in aligning their data with the State records. 8 8 To Add a Fund or Not? Because the category code is part of the FNAT key mapping, a separate fund mapped to a FNAT key with the category code must be used or the SAM99 will be unbalanced. 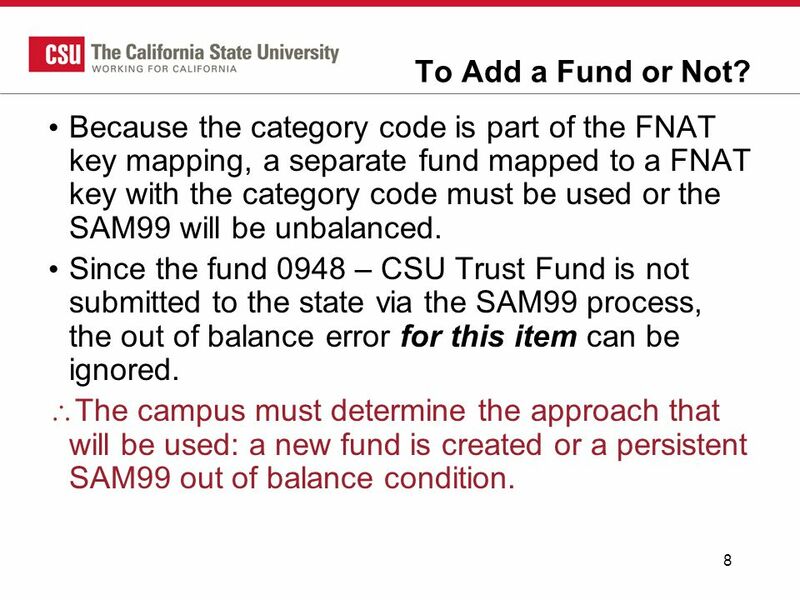 Since the fund 0948 – CSU Trust Fund is not submitted to the state via the SAM99 process, the out of balance error for this item can be ignored.  The campus must determine the approach that will be used: a new fund is created or a persistent SAM99 out of balance condition. 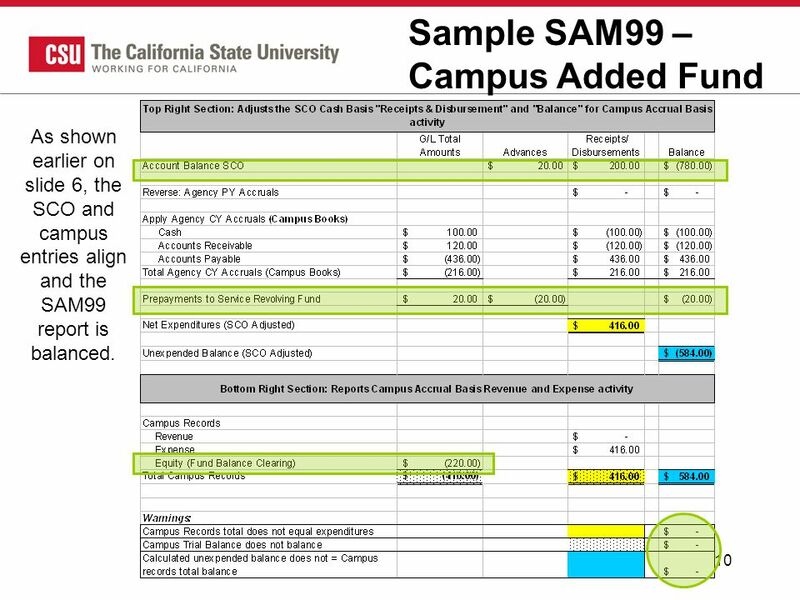 10 10 Sample SAM99 – Campus Added Fund As shown earlier on slide 6, the SCO and campus entries align and the SAM99 report is balanced. 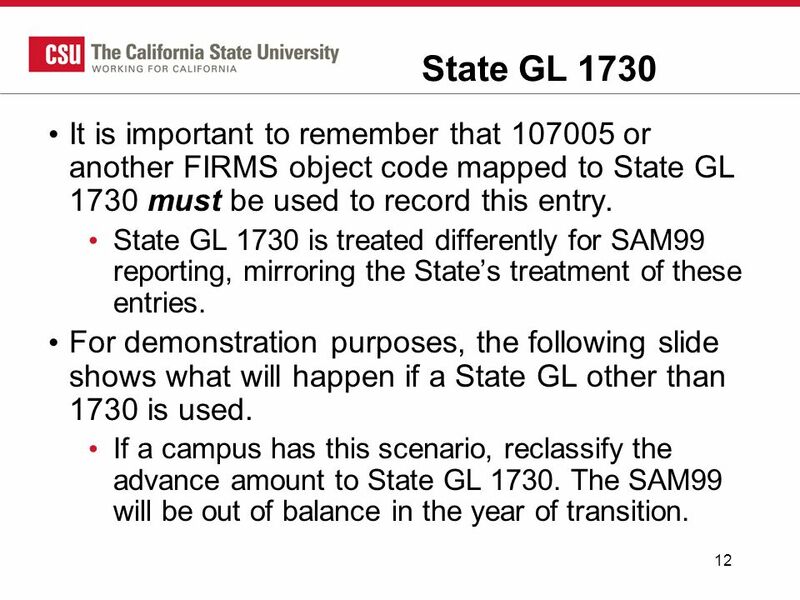 12 12 State GL 1730 It is important to remember that 107005 or another FIRMS object code mapped to State GL 1730 must be used to record this entry. State GL 1730 is treated differently for SAM99 reporting, mirroring the State’s treatment of these entries. For demonstration purposes, the following slide shows what will happen if a State GL other than 1730 is used. If a campus has this scenario, reclassify the advance amount to State GL 1730. The SAM99 will be out of balance in the year of transition. 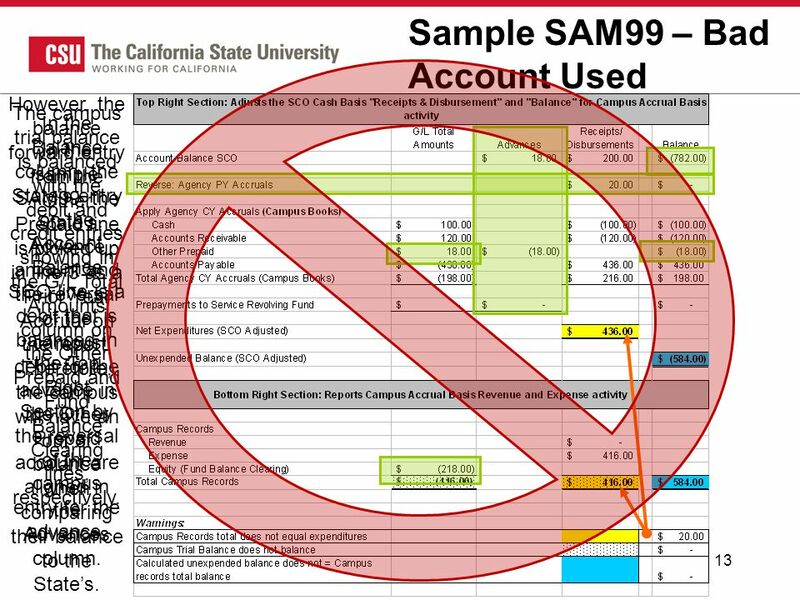 13 13 Sample SAM99 – Bad Account Used In the sample SAM99, the State’s Advance amount and the reversal of the campus debit for the advance in the Other Prepaid account are aligned in the Advances column. In the Balance column, the State’s entry on the Account Balance SCO line is a debit that is balanced in the Top Right Section by the reversal of the campus entry for the advance. The campus trial balance is balanced with the debit and credit entries showing in the G/L Total Amounts column on the Other Prepaid and Fund Balance Clearing lines, respectively. However, the balance forward entry from the Other Prepaid line is picked up in line 3 as a Prior Year Accrual on the report. Therefore, the campus will have an out of balance when comparing their balance to the State’s. 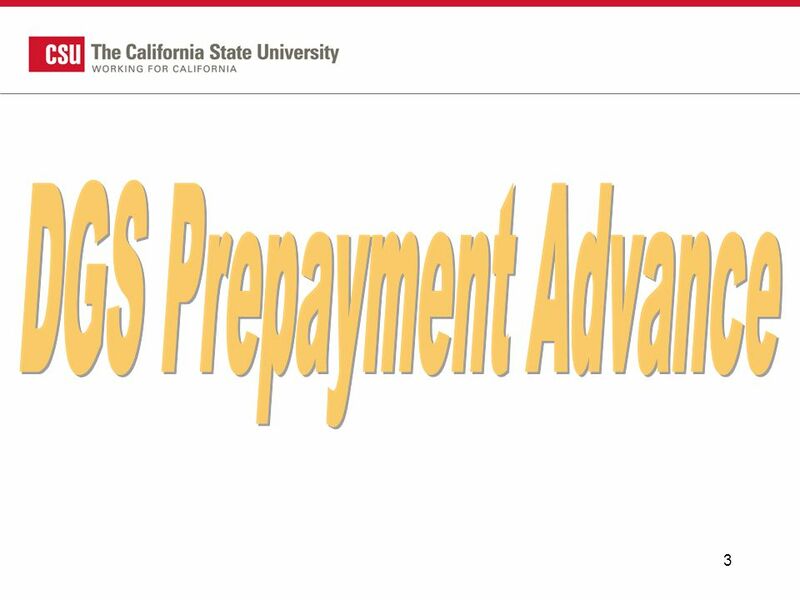 14 14 DGS Prepay Advance - Recap Journal Entry to Record the Advance: DR - 107005 Prepay Service Revolving Fund-Services CR - 305022 Fund Balance Clearing Campus may choose either: To add a fund mapped to category 98. [Recommended] ─ Or To record the advance in a fund not mapped to category 98. 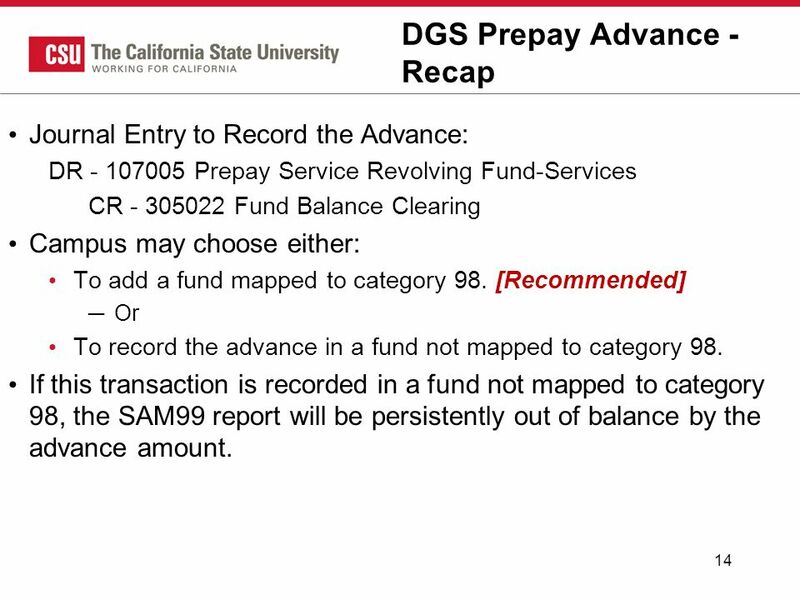 If this transaction is recorded in a fund not mapped to category 98, the SAM99 report will be persistently out of balance by the advance amount. 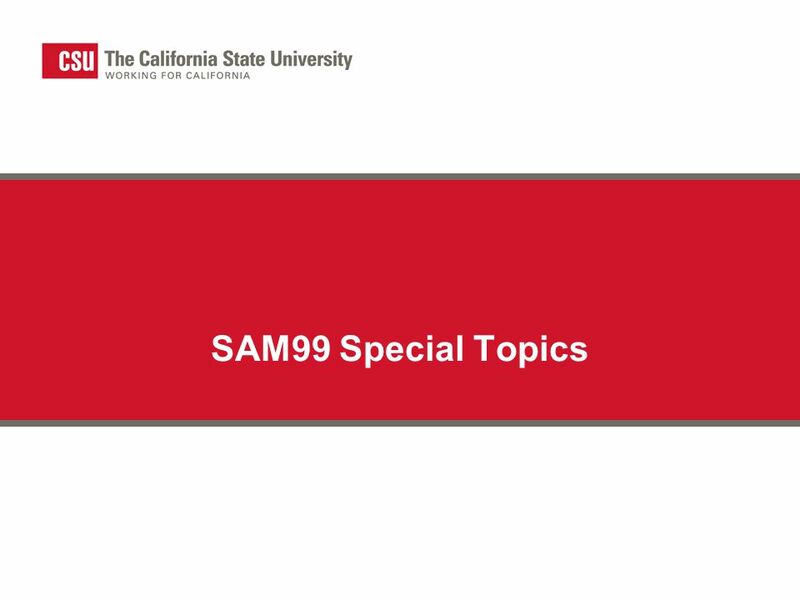 Download ppt "SAM99 Special Topics. 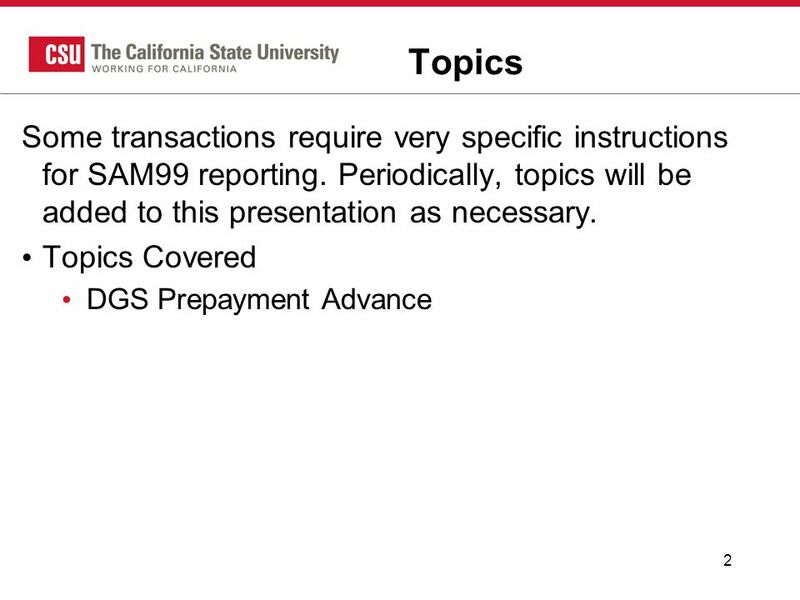 2 Topics Some transactions require very specific instructions for SAM99 reporting. Periodically, topics will be added to this presentation." Chapter 7 Accounting Information Systems Copyright © 2011 by The McGraw-Hill Companies, Inc. All rights reserved.McGraw-Hill/Irwin. Posting Journal Entries to General Ledger Accounts Making Accounting Relevant Every business completes business transactions daily. Think about the various. Revenue Management Program – RMP October 23 and 24 th Training Manual Cash Managment. April 17, 2007D. Brothwell, CPSLO 1 Central Payroll Activity Workshop Financial Officers Association Annual Conference - April 2007. THE ACCOUNT An account is an individual accounting record of increases and decreases in a specific asset, liability, or owner’s equity item. A company. 1 A ccounting Principles, Weygandt, Kieso, & Kimmel.  This presentation is designed to provide you information about Journal Entries  You can advance to the next screen at any time by hitting the forward. 05/06 Year End Meeting Reconciliation of Campus Records to State Controller – SAM99 SAM99 Reconciliation and Year End Submission. May 21, Budget Activity Budget Roll Forward Relationship to Reserves Year End Training May 21, 2007. Common Reporting Errors. Identified by the SCO in Prior Years – Legal SCO recognizes revenues only for current year and prior year. Anything older than. 1 Cash and Investment Accounting for Year-End and GAAP Presented by Sherry Pickering and Lily Wang April 16, 2007. 1 SWAT (SystemWide Allocation Transfer) Presented by Lily Wang May 21, 2007.